This tool is offered by one of the giant accounting publishers on the French market. EBP offers you a software to carry out your general accounting in complete serenity. 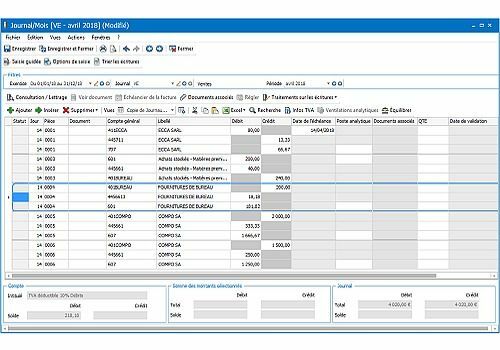 EBP Compta Classic allows you to make your accounting entry while being accompanied by the computer tool. You will be able to track and manage your payment deadlines, automatically import your bank statements, but also benefit from the statistical tools available on a dashboard. On the latter, you will be able to follow the turnover, the accounting result, your margin, the balance of your bank account, the status of outstanding receivables and supplier debts, etc. EBP Compta Classic is available online but also for purchase on Windows. Ipsum is a software suite for corporate accounting management. Queoval is an accounting software for training centers, VSEs, SMEs, and accounting firms.